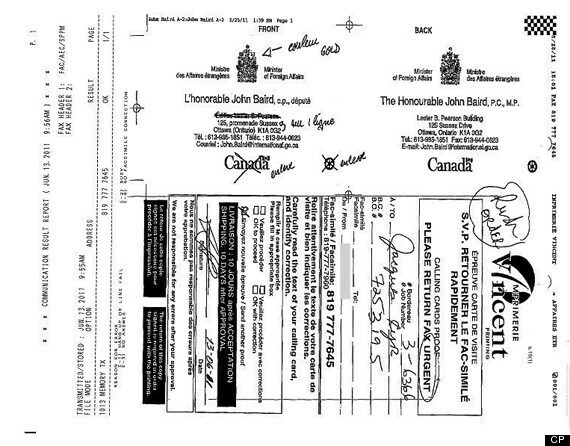 John Baird's fancy business cards have prompted a fresh "English-only" controversy for federal Conservatives. Language watchdog Graham Fraser has said the Department of Foreign and International Trade violated federal language law by printing cards for the minister that were only in English, the National Post reports. Though Baird also ordered bilingual cards, a new report by Fraser says that having two sets violated Canada’s Official Languages Act and federal branding requirements to promote both official languages in Canada. The Post reports that Fraser recommends Baird fix the problem before October. The Foreign Minister’s business cards first courted controversy in 2011 when it was revealed Baird demanded a series of unusual changes. Baird requested — and received — a gold-embossed Canadian coat of arms and ordered the word “Canada” dropped from the design. Both changes were contrary to government rules. He also insisted that “Lester B. Pearson Building” be removed from the address, thereby erasing the name of a former Liberal prime minister, and made his name the biggest type on the card. But it seems it is the unilingual change that has come back to haunt Baird at exactly the wrong time. International Co-operation Minister Julian Fantino is currently denying that he ordered that all correspondence in his name be in English only. On Sunday, The Canadian Press reported that staffers at the Canadian International Development Agency received both verbal and written directives to make such a change, but the plan was abandoned after New Democrats filed a complaint. An email from a Fantino staff member was included, which read: “I would like to reiterate that ALL correspondence signed by the minister be sent in English." Fantino’s office is claiming the email was altered, but the unnamed source who provided it vows no changes were made.